I love thumbprints! These look tasty. I'm going to give it a whirl! Did you use the rolled oats and almonds whole or put them in a food processor first? Yes. I measure out the oats and almonds before I grind them up. Of course these look fabulous!! Thanks! Thumbprints are my favorite! 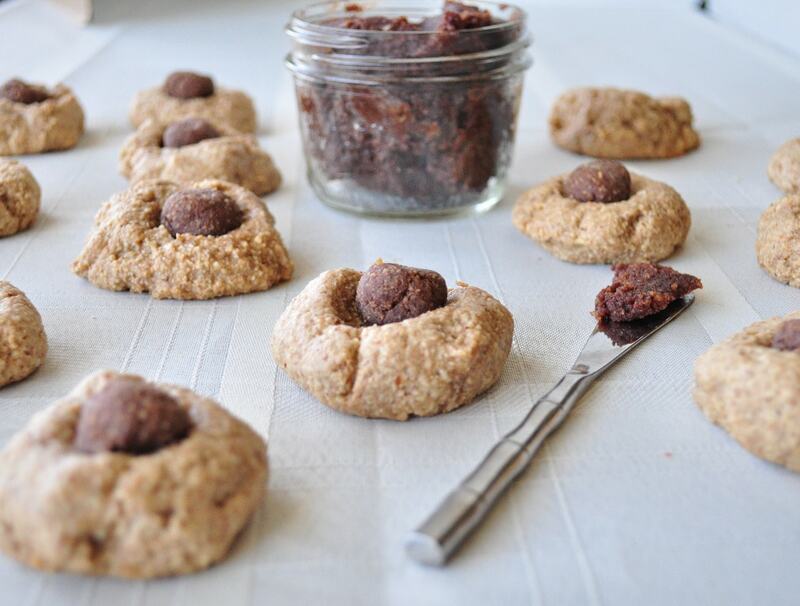 These remind me of the amazing chocolate peanut butter thumprints I used to make in high school : ) But healthier! They are pretty yummy. I love all the combinations you can make with thumbprints. No, I grind the oats and almonds in the blender after measuring. That way, they are almost like a powder. I went back and read the instructions and I noticed that I never even put the instructions to grind the oats and almonds. I edited the post and it should make much more sense now. Thanks for catching that! Made these this weekend! Used semi sweet chocolate chips instead of the nutella filling. WHOLE family from kids to grandparents LOVED them! Grab some milk and enjoy! Amazingly delicious! WHOLE family enjoyed these! What other oil options would work aside from Walnut? Coconut oil would work well. Haven't tried this yet but looks delish! However I wanted to ask where you got that metal spoon? Can one use almond flour instead of white whole wheat? Maybe if you add an some eggs? Hi - I love your blog! The link to the vegan nutalla recipe isn't working. I would love to try your recipe. Hi Eryn! I am so sorry. That was one of about 10 blog recipes that went in my cookbook. I apologize for removing it, but it was part of my contract agreement. :( You can check out the book here. http://tinyurl.com/prf3slb It is filled with mostly brand new recipes and it's under $12.